The engineering design process is central to engineering. Engineers use the engineering design process to create technologies. 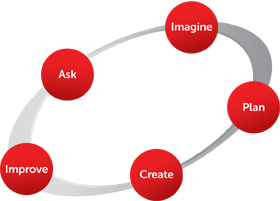 For our elementary engineering curriculum, we developed an age-appropriate five-step engineering design process: Ask, Imagine, Plan, Create, and Improve. Did you know you can apply this problem-solving tool to problems outside of engineering? Throughout the school day, your students encounter numerous problems that they’ll need to solve. Our engineering design process can give your students a process to solve their everyday problems more effectively and a chance to practice important 21st century skills like collaboration, communication and critical thinking. Over the years, educators have shared with us the innovative ways they adapted EiE’s five-step Engineering Design Process (EDP) to the help their students solve a problem. Below we share our favorite examples! How much do you know about engineering? Think you can spot common misconceptions about the field of engineering? Does your class need to come to a unanimous decision soon? Try using the structure of our engineering design process to reach consensus. A 4th-grade class used our EDP to figure out where they should take their next field trip. Together, the students tackled the problem. They asked questions and generated criteria and constraints for choosing the trip—for example, proximity to their school. They brainstormed possible trips, identified variables between the suggestions, and evaluated how each potential trip met the criteria. Then they analyzed the data to solve the problem of where they should visit! This is a great practice to implement in your classroom as it encourages students to communicate effectively, consider problems in context, and make tradeoffs between criteria and constraints! Most educators teach their students a typical writing process that includes stages such as: “Ideas & Plan,” “Draft,” “Revise,” “Edit,” and “Publish.” Next time you assign a writing assignment, guide your students through a different type of writing process that uses the EDP’s structure. Every essay or writing assignment has a problem that the writer needs to address and answer for its reader. Rather than asking students to write about a topic, ask them to write about a problem that they want to explore in their essay. Have them brainstorm with a classmate possible solutions to the problem and then encourage students to identify the various constraints and criteria by which they’ll need to evaluate the possible solutions. This activity will provide all the points they need to include in their essay outline. After they’ve drafted their essays, ask them how they can improve them. Then remind your students that all good writing is a result of good revising! Every choreographer has a problem they need to solve: How do I plan the steps to this dance? 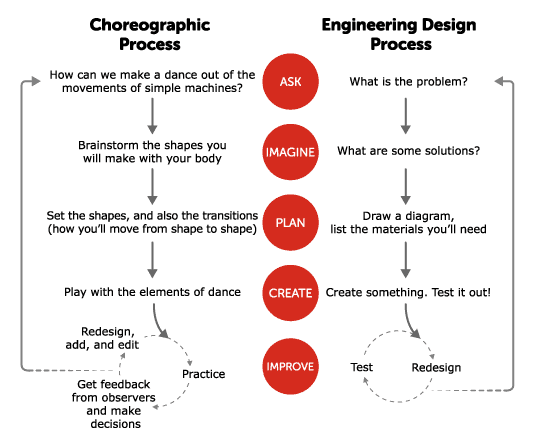 Last year, a dance teacher challenged her students to choreograph a dance to represent the movement of a simple machine as a STEAM extension lesson to Marvelous Machines: Making Work Easier. We love sharing this example as a useful STEAM activity as well. This last example is one of our favorites. An elementary school in North Carolina incorporated the structure of EiE’s engineering design process into their disciplinary practice. Students who were sent to the principal’s office met with the administrator and first articulated the problem/situation. Then they asked questions, identified the consequences of their behavior, and imagined alternative ways for handling the conflict. Together the administrator and the student developed a plan that would guide future behavior and empower the student to practice more effective ways to resolve conflicts and tough situations. We love this idea because students practice communicating effectively and assessing the implications of potential solutions. All skills they’ll need to navigate further conflict resolutions! 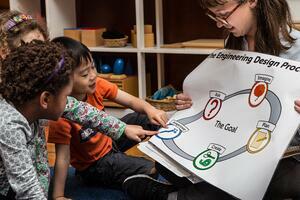 EiE aims to create the next generation of problem solvers. We love hearing how educators adapt our engineering design process and pedagogical strategies to further their students’ learning. Try using the engineering design process as a problem-solving tool in your classroom and provide richer opportunities for your students to practice the skills they’ll need to succeed. Engineering comes in many different forms. Think you know them all? Could you spot common misconceptions and identify unlikely engineers? Take our engineering IQ quiz and find out.